The new Canon EF-S 18-135mm f/3.5-5.6 IS USM offers an appealing combination of a versatile 7.5x zoom range, fast and silent auto-focusing, good enough image quality and construction, and decent value for money. Image quality is pretty good rather than outstanding. Centre and edge sharpness isn't great throughout the zoom range at the maximum aperture, but stopping-down by one stop sharpens things up considerably, whatever focal length you use. Chromatic aberrations aren't very well controlled, though, and there's obvious geometric distortion at the wider focal lengths and some obvious corner shading at the maximum aperture. The lens also doesn't ship with a hood, which is only available as an optional and rather expensive accessory. Auto-focusing is very quick, with the new Nano USM motor appealingly smooth, almost completely quiet, and fast enough to keep up with fast-moving subjects in Live View/Video mode when used with the new EOS 80D DSLR camera. The ability to instantly manually override the AF system via the focus ring if required is also a nice touch. With its all-plastic construction, the Canon EF-S 18-135mm f/3.5-5.6 IS USM isn't going to withstand too many knocks and scrapes, but it is very light and therefore a good partner for the EOS 80D that it ships as a kit with. The capable image stabilisation system makes it easy to hand-hold the camera and still get the shot in most lighting conditions. 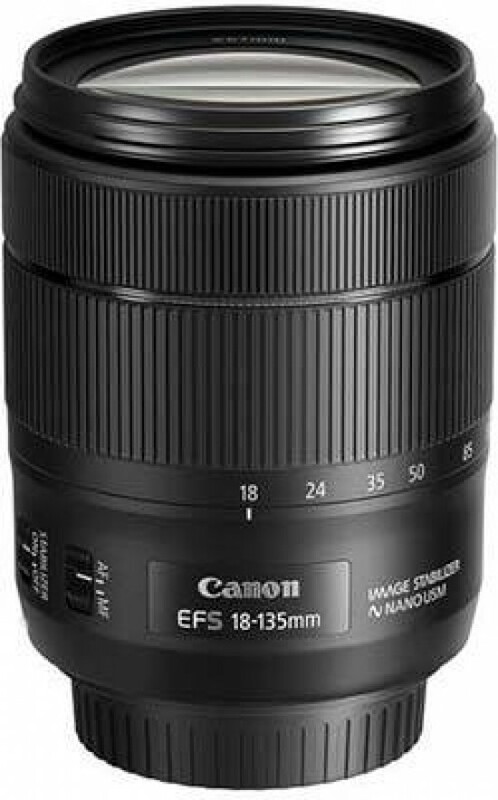 In summary, we can recommend the Canon EF-S 18-135mm f/3.5-5.6 IS USM as a relatively small, lightweight and versatile zoom lens for APS-C DSLR owners that delivers pleasing results for both stills and video.